No Foreign Exchange Fee Mark-Up: You will not be charged a Foreign Currency Conversion mark-up on international foreign currency purchases made online or outside of Canada. Only the exchange rate applies. 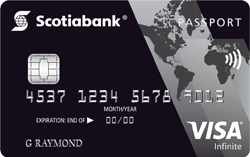 When you spend at least $40,000 in purchases annually on your Scotiabank Passport Visa Infinite account, you will earn an additional 10,000 bonus Scotia Rewards points!